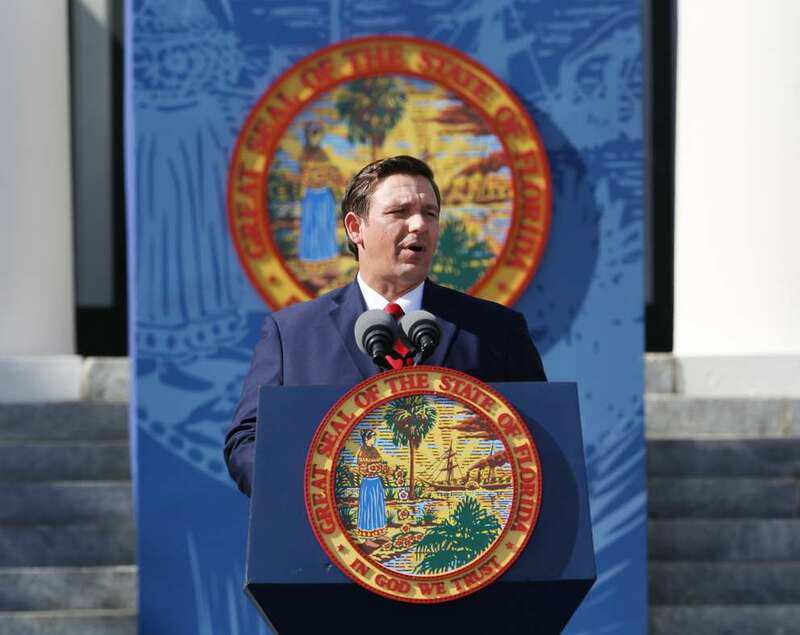 Florida's new 40-year-old governor was sworn in Tuesday at high noon, when he immediately said government should play a smaller role in the lives of Florida residents. TALLAHASSEE — Vowing to limit the role of government while keeping a key campaign promise of protecting the environment, former U.S. Rep. Ron DeSantis became Florida's 46th governor on Tuesday. 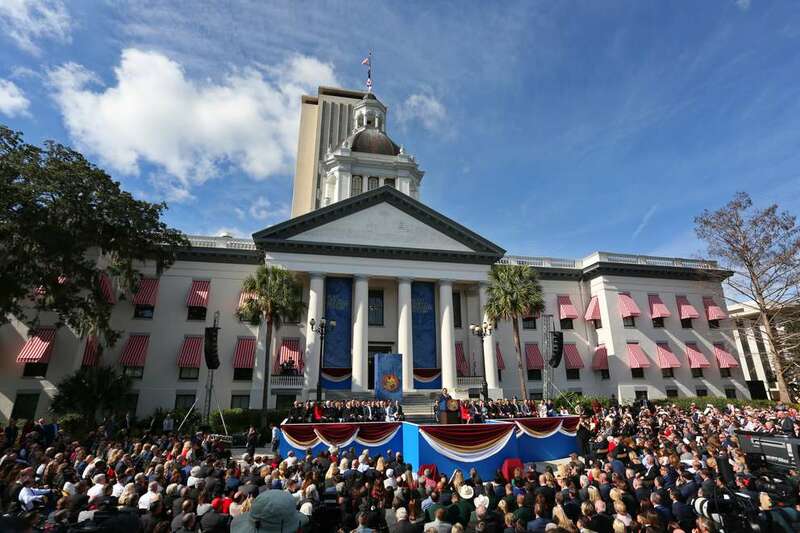 Heavy on military and religious imagery, the swearing-in ceremony included a 19-gun salute and a Florida National Guard flyover. 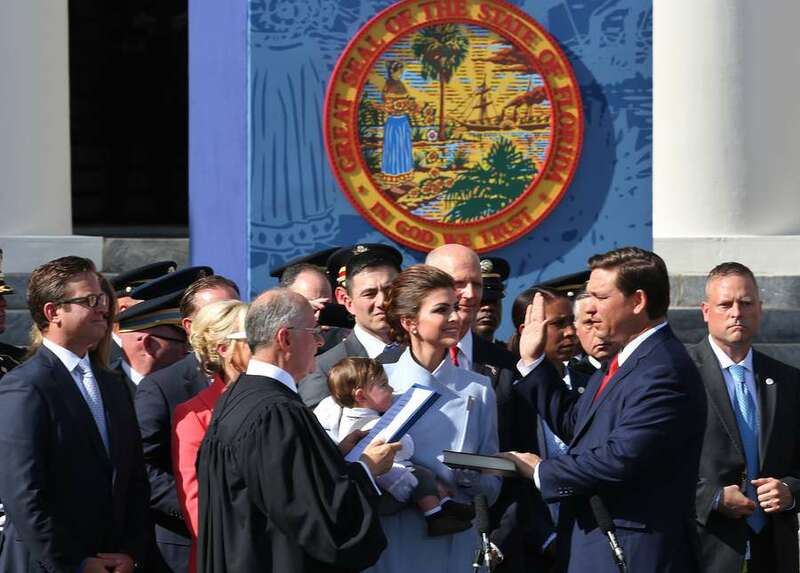 DeSantis, a former Navy lawyer, placed his hand on a Bible and took the oath just before noon. "I take the helm of the ship of state as a Florida native, as a veteran of our nation's military, conscious of my own deficiencies, mindful of the great trust that has been placed in me and thankful to so many of you who have prayed for me," DeSantis said, addressing the crowd of about 3,000 elected officials, donors, former governors, Supreme Court justices and members of the public. He called for a smaller role in government that would require greater self-reliance and some divine intervention, too. "Our rights are endowed by God, not government; that we the people loan power to government under the Constitution in order to protect our rights," DeSantis said. "That government's role is not to run our lives for us but to provide what Lincoln called an 'open field and fair chance for one's industry, enterprise and intelligence.'" Government's retreat in favor of the private domain was reflected in DeSantis' cancellation of the traditional inaugural parade down Monroe Street. The reason, DeSantis said, was so he and his wife, Casey, could return to the governor's mansion to baptize their 9-month-old son, Mason, with water they brought back from the Sea of Gaililee in Israel. DeSantis' ascent to Florida governor would have seemed a near impossibility less than a year ago. DeSantis started his campaign as a relatively obscure congressman from the Jacksonville area who drew small crowds in the Panhandle. Many of the insiders sitting at Tuesday's inauguration gave him little shot of making it past his primary. In those early stages, however, his campaign was all about President Donald Trump. A subsequent endorsement from Trump carried him past favored candidates as did his forced association with Gov. Rick Scott, whom he praised throughout the campaign. Scott's influence was waning Tuesday, a day after DeSantis said he will "definitely" rescind some of the last-minute appointments by Scott, who's continued to name people to boards and committees in his final hours as governor before his own inauguration in the U.S. Senate later Tuesday. After his opening remarks, DeSantis' speech pivoted to a series of pledges, such as keeping Florida low-tax; fighting toxic blue-green algae, discharges from Lake Okeechobee and red tide; pushing disruptive health care reforms and continuing to help Hurricane Michael storm victims in the Panhandle. 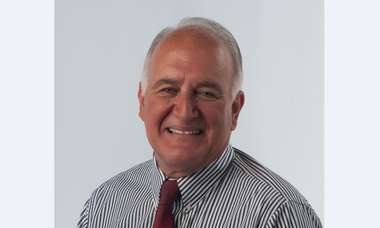 The crowd was further delighted when he charged that the state's reputation cannot "be further tarnished by the repeated failure of a small number of counties to conduct elections in a transparent and lawful manner," a reference to breakdowns in the deeply blue Broward and Palm Beach counties during the election recount. Palm Beach blew past deadlines and Broward didn't release public records to Scott regarding pending ballots. DeSantis, a history buff, wrapped up his nearly 20-minute speech promising "energy in the executive" in the spirit of Alexander Hamilton. The 40-year-old governor has promised reporters an eventful first week in office, as he's expected to use his newfound power to fill three vacancies on the Supreme Court with conservatives, take early action on environmental issues and re-evaluate the employment of some elected officials, including Broward Sheriff Scott Israel. Many specifics of DeSantis' agenda have remained murky as he's only recently began to grant regular one-on-one interviews with Florida reporters. But in the two months since DeSantis' election (which was confirmed by a machine recount), the new governor has shown glimpses of moderation, including tapping two Democrats for top jobs in his administration, that are at odds with a hard-right persona honed on Fox News and on the campaign trail. Still, the two days of inaugural events were unmistakable celebrations of a decisive victory for the Republican Party in a "purple" state that seems to become more and more red after each election cycle. 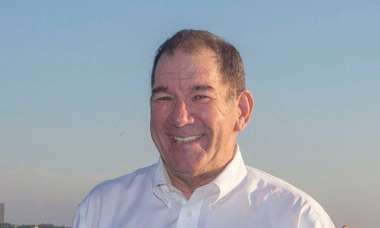 State Rep. Danny Burgess, R-Zephyrhills, an Army reservist who was tapped by DeSantis to lead the state Department of Veterans Affairs, said he's extremely excited to see DeSantis carve through his ambitious agenda and to serve as part of the administration. Burgess' confirmation hearing is Friday. "If you had to pick one word (for DeSantis' agenda), it's 'bold,' " Burgess said after the swearing-in. "It is all these things that are so important to our state that he laid out in a single speech and every single one of them are going to have profound impact on the state of Florida." State Sen. Annette Taddeo, D-Miami, said she found DeSantis' pledge to protect the environment comforting. But she said she was disheartened by his decision to condemn sanctuary cities — "we don't have any," she said — and his insistence that judicial activism is a problem. 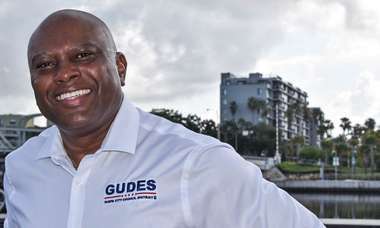 "You'd think based on his speech that he was elected by a super-majority and that it wasn't the closest governor's election in Florida history," Taddeo said. "He was elected to govern for all of us, one would hope." A similar skepticism seemed to be shared by a modest crowd of protesters, who were among the people gathered to watch the ceremony from Monroe Street — temporarily renamed Ron DeSantis Way. There they held up giant, inflatable eyeballs, with signs that read: "We will be watching you." Times/Herald Tallahassee reporter Samantha J. Gross and Miami Herald reporter David Smiley contributed to this report.